Family Sleuther: Digitized Record Indexes Are Great, But They're Not Everything! Digitized Record Indexes Are Great, But They're Not Everything! A rainy 4th of July holiday may upset patriotic Americans with a hankering for outdoor BBQs and fireworks, but I was perfectly content to hole up inside and dive into genealogy. God Bless the USA, my internet connection, and digitized probate records! I don't know about you, but sometimes when I'm looking for a break from my very difficult research questions I set them aside and dabble with other family lines. That's how I landed on my Weeks family. My fourth great-grandparents Thomas Weeks and Lydia Griffin completed a marriage bond in Perquimans County, North Carolina on January 19, 1829. The County is a tangle of similarly named Weeks family members, creating a difficult mess for genealogists to sift through and set straight. Who was Thomas' father? Many online genealogies identify Wilson Weeks as the man, but I don't see evidence to confirm that, so the slot remains empty on my pedigree chart. I need more proof than, "Well, every other tree said it was him, so it must be him..."
Who was Lydia Griffin's father? Here the online trees are more reticent to name a candidate (I admire their reserved judgment). Perusing Ancestry.com's online trees you'll see that the role of father is largely yet-to-be cast. Most folks admit they just don't know. Although there are a few that name Willis Griffin as the man. Was he Lydia's father? The name Willis Griffin appeared on Thomas and Lydia's marriage bond. 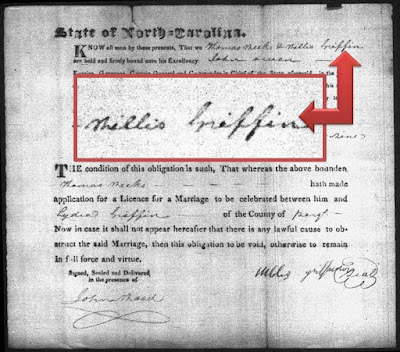 Willis Griffin was the surety or bondsman for the marriage, but the document does not specify his relationship to Lydia. Sure, the bondsman was typically a family member - father, brother or uncle - but which familial role was actually his? This question led me to search for a probate record for Willis. Perhaps he left a will that named heirs and would specify a relationship to Lydia. I typed the name Willis into Ancestry.com's probate index and pulled up several promising record matches. But none of them mentioned Lydia, and without her I was unable to determine whether any of the Willis Griffins were the marriage bondsman. I next turned to Lydia and Thomas. Could I find their probate records? Would they have any answers? I knew that Thomas and Lydia moved from North Carolina to Indiana where they lived in Henry County at the time of the 1850 US Federal Census. Thomas was not enumerated in the 1860 census with Lydia. It appeared he passed away sometime between 1850 and 1860. This should be easy enough. 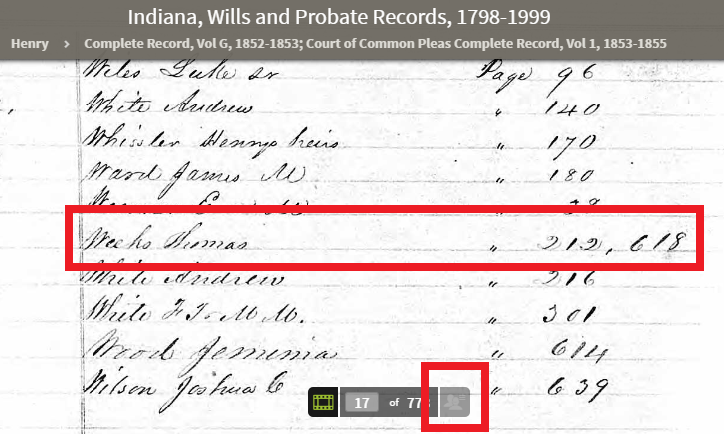 I typed "Thomas Weeks" into the Indiana probate search, and immediately had a match. A match in name only. This Thomas lived in a different county and the probate file was being processed in 1870. Too late. My initial concern was that Henry County was not part of Ancestry.com's digitized Indiana probate records. I browsed the collection to see whether it was among the included counties. Sure enough, Henry County was included. Maybe Thomas Weeks didn't have an estate to go to probate, and that's why there was no record. I found a record set that covered the early 1850s and began thumbing through it. I was surprised - and relieved - that there was an index at the beginning of the book. However, I quickly noticed that Ancestry had not digitized the index. All the names were there written in hand, but they weren't digitally searchable! 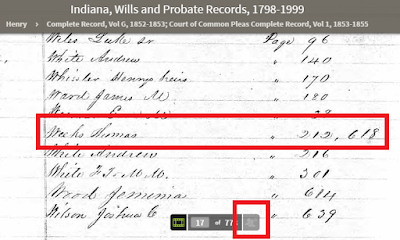 Although not digitally indexed, Thomas Weeks was in the handwritten index of probate records. Thomas' probate package was a gem that included his exact death date and location, as well as the names of his living children. If I had relied solely on the results of the digital index, my family history would have suffered sorely. Starting to wise up, I next turned to Lydia (Griffin) Weeks. Lydia didn't appear in the 1870 census, so I speculated that she died sometime between 1860 (her last census appearance) and 1870. A keyword search of Indiana's probate records turned up a name match, but it was to her daughter of the same name. In Lydia's case, I discovered that one record set included two different probate books each with their own separate handwritten indexes. The first book's index was digitized. The second book's index? You guessed it...not digitized! And who, do you think, was among the names on the second book's index? Yes! Lydia (Griffin) Weeks! Like Thomas, her probate package provided her exact death date and location, and listed each of her surviving heirs. While neither Thomas or Lydia's probate packages identified their parents, the lesson to be drawn was imperative. Digitized and keyword-searchable genealogy record indexes are great, but they're not everything! We must always browse the original record sets. Or we risk overlooking mission critical records. Clearly, I need to take this lesson and apply it to the North Carolina probate records to make sure Willis Griffin hasn't been overlooked by the digital index. I may even give the much-loved Wilson Weeks a spin.